One of the many advantages of having PT Distinction as your personal trainer software is it makes it very easy to see when your clients are due their next programs. Meaning you never have to worry about forgetting to update a program on time or having to set up records of each renewal date. This video shows you how to see when your clients programs come to an end. There's two places you can easily see when all of your clients need new programs. This first is at the top of any page, under Alerts. When you click Alerts you'll see our traffic light system. Red means clients are waiting for new programs to be scheduled. Orange means they're coming up for a new program in the next seven days. Gray means you haven't scheduled that client a program yet, and green means they are all good. The second place is on the home page. If you come down and click on Clients Need Programs you'll see a slightly larger version of the same traffic light system. If you click on any of these icons, it gives you more details. Clicking on the red icon shows which clients are waiting for new programs and the dates that their last programs expired. 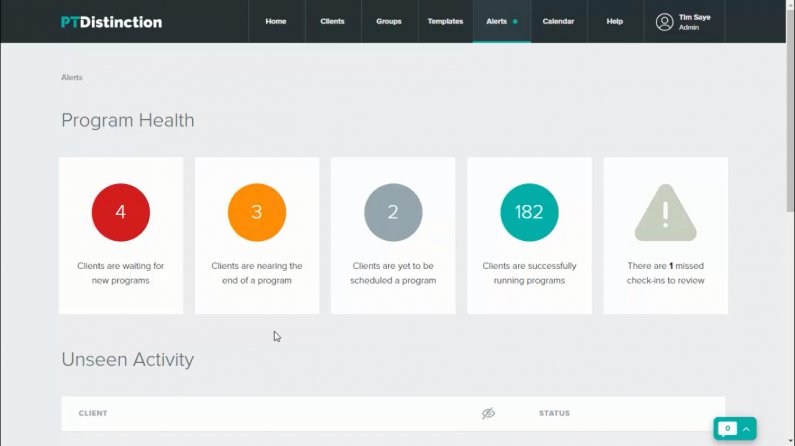 You can click a clients name to go into their dashboard and give them new programs or take from your templates. When you click on the orange icon, it lets you know which clients have program renewals coming up this week, and it'll let you know the date their current program is scheduled to end. Once again, you can click on the clients name, go into their dashboard, and give them programs. Clicking the green icon will show you all of the clients who have more than 1 week running on their current programs, and which date clients have their last scheduled workout. So you can see who needs new programs at any point in time, and keep on top of it with ease. Of course, in PT Distinction, you don't have to schedule your client's programs. In order to get this feature working, it's a good idea to schedule the last workout in each program phase. When you do this the software knows when the phase comes to an end and the traffic light system kicks in. If you're with PT Distinction there's no need for files and records to keep track of when your clients are due new programs. Like everything needed for quality online training PT Distinction will do all the heavy lifting for you all for you. You can enjoy a 1 month free trial of the worlds highest rated personal trainer software here .